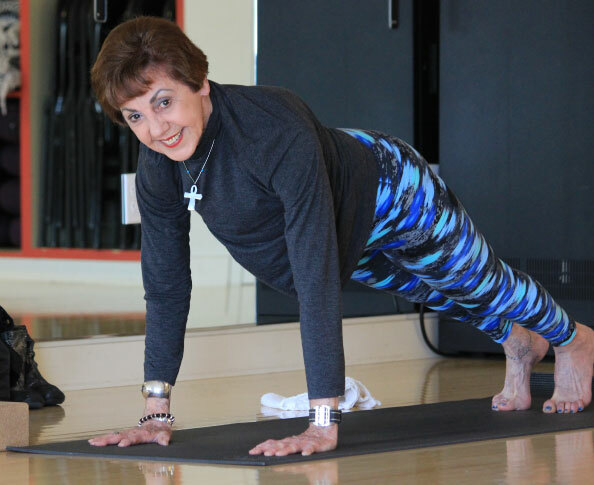 OFJCC yoga instructor Betty Strain shares her 50 year journey with the practice of yoga and advises us to keep going from her vantage point at 83. My philosophy is to not sit around doing nothing—get out and do something! As my mother used to say with her accent, “You have to keepa’ going,” and yoga is what keeps me going. 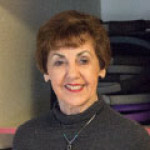 From being a novice in 1964 to a dedicated instructor today, the philosophy of going forward is part of my yoga journey. One day in 1964, my next-door neighbor asked me to go with her to her yoga class. Little did I know then just how wonderful it was going to be for me. In my first class, I knew I had the strength but realized my flexibility needed work. The goal of yoga is to put your body in its proper alignment. It looks easy, but there’s more to it than meets the eye. The key is in the breath. I understood the physical aspects right away but it was some time before I learned of the spirituality and inner peace. Not long after beginning, my yoga teacher had to leave the country for a limited time. She asked me to substitute for her and teach while she was gone. She said she recognized my talent and I felt deeply honored she had chosen me, but I was also terrified at the prospect. But she said she had every confidence in me and encouraged me to give it a go. My first time teaching yoga in 1964 in Palo Alto, I knew it was my calling. I loved teaching. My students and I learned a lot together and I felt that it would change my life forever. Betty teaches her Iyengar Yoga class at the OFJCC. After teaching for some time, I felt the need to go to India–to the source of all yoga knowledge. A wonderful opportunity presented itself to me. The eminent guru and yoga teacher Mr. B.K.S. Iyengar accepted me as one of his pupils. I didn’t hesitate; I went to India! Under Mr. Iyengar’s instruction, I blossomed. He was indeed a perfectionist, and as student teachers of yoga, we were expected to demand perfection of ourselves too. I knew I could meet his demands and did. I carry his teachings with me, and my students in turn also learn his teachings through me. Over the years while teaching yoga, I have been delighted by the transformation in the lives of my students. Yoga has blessed my life for the past 53 years. I have lived to see my efforts bear fruit, and the satisfaction and joy are greater because I am helping people. I have been teaching yoga here at the OFJCC for almost five years. I do get compliments, but some of the best are from the students who say, “You look so young” and “I want to look exactly like you when I am older.” This gives me a wonderful feeling of accomplishment and a complete gratitude for yoga. The other added bonus is the relationships I have formed over the years because of teaching. I get the opportunity to meet interesting people and form lasting friendships. I followed my mother’s advice and kept going. I encourage you to do the same – life is about learning, isn’t it? Keep going and keep learning. Born of Portuguese parents in Mountain View, CA, Betty grew upon her parents' dairy farm loving the great outdoors. She trained in the Iyengar method of yoga in India under the tutelage of B.K.S. Iyengar. She is passionate about travel, meeting people and changing lives with yoga. Betty, you are an inspiration to all of us!!! Looks easy? wrong if you do it right and Betty will see to it that you do it right!